I know it’s a bit late for a Christmas theme but this post has been rumbling round in my head since that time. Thanks to a watery, chesty virus keeping me from work, I have the opportunity to put finger to keyboard. It’s a ill wind and all that. This Christmas was a weird one for my family. We all spent it in ways never experienced before. My sister went to her ‘in laws’, my brother went to his, the only ones he has ever had, as he was married for the first time this summer. My esteemed parents stayed home alone and indulged, allegedly cheerfully, in roast beef and alcohol. Their aloneness (I think I have made up this word) made me a little uneasy. Someone else who added to my unease was Mavis, who was contracted to work on Boxing Day. This would not have been such a bad thing had Whizz and I not agreed to go to Horace’s, in Canalshire (work it out), for the festive season. During the run up to Christmas, we all hoped that the Pharmaceutical chain for whom Mavis works, let’s call them ‘Wellies’, would be able to swing it so she could have the Boxing Day off, but at the last minute, several people who were also working the same shift, handed in their notices and that was that. Mavis was home alone too. Henny how, on to some post-Christmas entertainment. 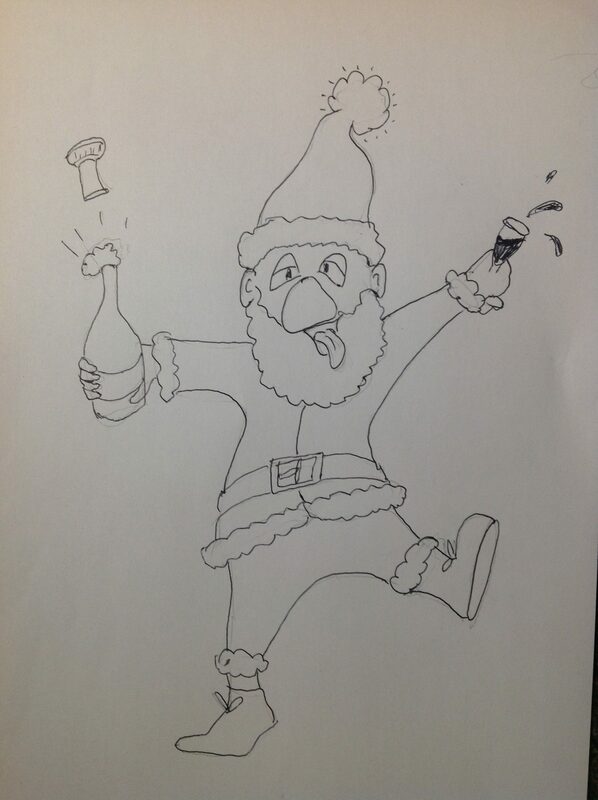 First: I was recruited by my school to take on the task of being Santa for the littlies (another made up word). I was presented with a beautiful and thankfully elasticated, scarlet velour outfit, and a wig and beard of the bristly, curly variety. I adopted a voice that Whizz, when I tried it out on him, said sounded more like Winston Churchill than Santa, but since I don’t think he has ever conversed with the latter, I took the remark as approbation, and assumed it in my role. I was led by the head (duh, not my head, the head teacher), to the Foundation class, where I was introduced, amid childish gasps, to about 50 wee ones. I then settled into a side room and the children were called, one at a time 50 of them – to come and tell me what they would like me to bring them on my sleigh. A teacher attended to take photos. Unfortunately the combination of Churchill’s voice and a tickly beard became too much for my throat after the thirtieth child. I began to cough. My eyes watered and my nose ran into the pristine moustache, until a teacher had to intervene and suggest I took a comfort break. Poor little kids looked really worried but none seemed to notice that on my return, my voice had become less Churchillian and more Barbara Woodhouse. Second: At the same time as I was dressed as F.C., Mavis was bemoaning the fact that she was expected to dress as a Pixie for her work as a sales assistant in ‘Wellies’ (No, she didn’t wear wellies, that is the name of the shop. I did tell you before). On the few days before the big day, she went on the bus – in normal clothes, refusing to draw attention to herself, even though she would be wearing a coat. During the course of one day, a small but articulate child accosted her. 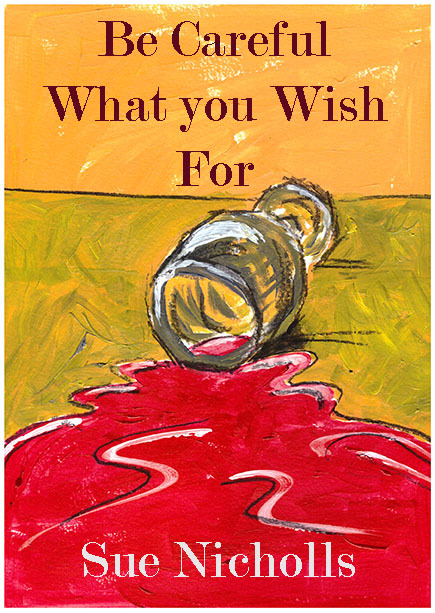 ‘Why aren’t you in the North Pole helping Santa?’ she demanded, clutching her father’s hand. The father collapsed into guffaws. I was rather proud of Mavis for this quick thinking. 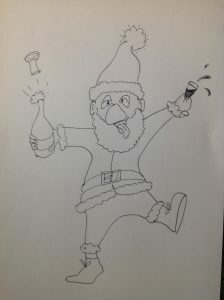 Third: Nothing to do with my Christmas, but one of our bed and breakfast guests shared this experience over a beer one evening. He had tickets for the World Darts Championship – the semi-finals I think. It seems that it is de rigueur to dress up for these occasions and so he wore his faithful Santa hat. This was no ordinary hat, it was remote controlled. At the touch of a button, the top wagged from side to side in time to a Christmas tune. Over the years the tune had worn a bit thin so he had disconnected the sound, but the hat still flopped to left and right at his ‘digital’ command. It seems that he and his son, took up a position near to a speaker. Every time the commentator yelled, ‘One hundred and eighteeee’, the vibration set off his hat so that it wagged from side to side in excitement. This guy is an engineer, not given to excitable outbursts, but clearly his alter-ego hat had other ideas. 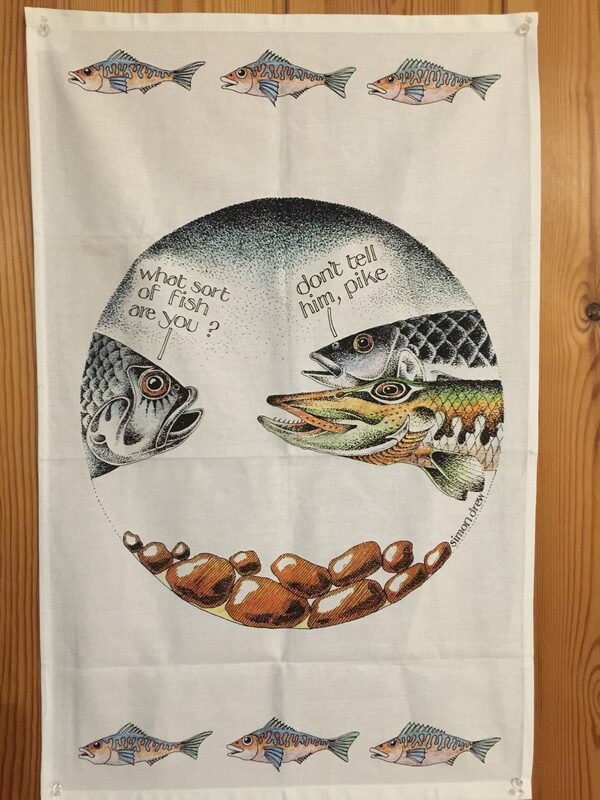 Ooh, here’s the other funny thing: I received a tea towel from my brother and sister in law. I know, not that exciting but it’s very funny. If you don’t think it’s funny you are either too young or you should not be here. Simon Drew picked up a pencil. Simon Drew. In my spare time, influenced in no small way by the above grandfather, I consumed every book available, starting with the books on my shelves, Peter Rabbit and friends, The Secret Seven, Famous Five, Naughtiest Girl, Chalet School, Black Beauty (so sad) and others. I read my brother’s Billy Bunter, Just William and Jungle Books then began on books my mother had read and before her, my grandmother and in some cases my great grandmother: Eric or Little By Little, Little Women, Tom Brown’s SchoolDays and I can’t remember what else. The stories from childhood that I remember most fondly, the magical, funny stories that were read to me by my mum or dad at bed time, and later read to myself, were A.A. Milne’s: Winnie the Pooh, The House at Pooh Corner and his poems in Now We Are Six and When We Were Very Young – Aah, Alexander Beetle and They’re Changing Guard at Buckingham Palace. No real clarification followed although Christopher Robin gives a child-like and inexplicable explanation of why he is Winnie, that being a girl’s name. There is no reference, after that first sentence, to the name Edward. So when Whizz pointed me at a very modern version of the transmitted word, a podcast, about that very subject I was interested. I suppose it is fairly common knowledge that Christopher Robin was the son of A.A. Milne and that the stories in the books are based on his toys, but who knew that Winnie the Pooh was named after a real bear? 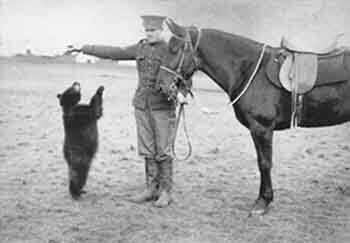 In 1914 Harry Colebourne of the Canadian Cavalry was en route to report to the Canadian Army Veterinary Corps (CAVC), when he spotted a bear cub on White River, Ontario Station, and bought her for $20. Winnie is short for Winnipeg, Harry’s home city. Harry kept Winnie throughout his service on the Canadian Western Front, and eventually she travelled with him to England as his pet and a mascot for the CAVC. Some time later Colebourne had to go to France, and he left Winnie at London Zoo. It was at London Zoo that the child, Christopher Robin, was to encounter Winnie. Because she had been a pet, she was gentle and could be stroked, and fed Honey. Christopher loved feeding Winnie and apparently returned with his father several times do do just that. He became so fond of the bear that he renamed his teddy from Edward to Winnie. Well, you learn something new every day. I would like to credit Futility Closet for the information in this blog. https://www.futilitycloset.com/2017/11/06/podcast-episode-176-bear-inspired-winnie-pooh/ and also Wikipedia. Follow the link to hear the whole episode and to see some amazing pictures of Winnie, her owner and also Christopher Robin feeding Winnie with HUNNY.